The AsthmaPACK Children’s Asthma Care Kit makes learning to manage asthma child’s play. This just-for-kids kit makes learning fun with engaging cartoon characters and age-appropriate devices. An exciting feature of this kit is the interactive bilingual (English/Spanish) coloring and activity storybook, “Tucker Tackles Asthma.” The book teaches how to correctly use a peak flow meter, spacer, and nebulizer. Stickers are also provided to decorate the child’s asthma management devices. 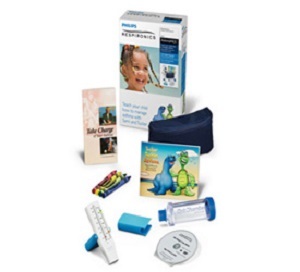 In addition, each kit contains a Personal Best Low Range Peak Flow Meter, OptiChamber Advantage Valved Holding Chamber, instructional DVD, asthma care booklet, crayons, and a carrying case. This bilingual (English/Spanish) coloring and activity book will introduce families to Tucker the Turtle and Sami the Seal – two friends who learn through their adventures how to take control of asthma and learn how to live a normal, playful life. The characters help teach kids how to manage asthma using a peak flow meter to measure lung function and a valved holding chamber and a nebulizer to take medications. The book also features fun stickers that can be used to decorate children’s asthma management products. OptiChamber Advantage Valved Holding Chamber helps patients get the best part of their asthma or COPD inhaler medication in the most efficient way. With optimal performance and optimal value, OptiChamber Advantage gives patients the advantage in metered dose inhaler therapy. And OptiChamber Advantage is an ideal pediatric chamber that easily adapts to all patient needs. Multi-sized pediatric masks attach directly to the mouthpiece for superior fit and comfort when assisting infants and small children with inhaler medications. When no longer needed, the masks can be removed for optimal drug delivery without buying a new chamber. OptiChamber Advantage’s replaceable low-resistance valve is sensitive enough to respond to the lowest of pediatric flow rates. And its MDI adapter accommodates all CFC and HFA inhalers, making OptiChamber Advantage the most versatile and cost-effective product of its kind. This case holds the Personal Best peak flow meter and OptiChamber Advantage holding chamber along with up to 3 inhaler medications. This DVD teaches patients how to use a peak flow meter and what the measurements mean and shows them how to facilitate and improve delivery of inhaler medications with a valved holding chamber. English and Spanish languages. Available in English and Spanish, this educational booklet includes simple explanations about what happens during an asthma episode, what are asthma triggers, how to follow three-zone asthma management, how to manage asthma at school, and what are nocturnal, exercise-induced and occupational asthma.